Shimano is introducing road hydraulic disc brakes for use with mechanical shifting for the first time. Shimano has also launched a new version of its 105 groupset giving the opportunity for 105-equipped 11-speed bikes with hydraulic braking and mechanical shifting. Shimano released hydraulic disc brakes for the road last year, but the hydraulic braking mechanism was integrated into the Di2 electronic lever (ST-R785). That meant that if you wanted hydraulic disc braking with a road groupset from Shimano, you had to have electronic shifting too; you couldn’t have hydraulic braking and mechanical (cable-operated) shifting. 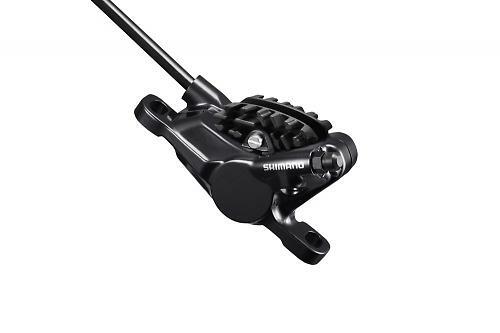 That has changed now that Shimano has launched the ST-RS685 (main picture), a compact hydraulic disc brake lever for mechanical shifting, so you use regular derailleurs and regular cables. Shimano see this as an Ultegra level product but it is compatible with the mechanical version of Shimano’s top-end Dura-Ace groupset and it also works with the new 105 groupset that was launched today. Shimano has included a mineral oil reservoir and brake system in the mechanical lever, while managing to keep that lever compact. The lever features a 10mm reach adjustment to customise the fit for people with smaller or larger hands. The brake caliper Shimano introduced last year, the R785, has been replaced by the RS785 (Shimano has slung an S in there). The new brake caliper, which works with both electronic and mechanical shifting levers, has improved cable routing, according to Shimano. "The [old] R785 uses a banjo fitting for the hose which fits onto the outside of the caliper," says Mark Greshon, Shimano's UK brand manager. "The new [RS785] caliper doesn’t use a banjo fitting, it uses a direct hose connection which goes straight to the top of the caliper. Also, it has a slightly slimmer design so it looks a little better for road bike use. "The main reason for switching to this new caliper is that in certain situations, especially if the frame manufacturer chooses to mount the caliper on the inside of the rear triangle, it’s possible to catch your heel on the outside of the banjo [with the R785]. With this new caliper [the RS785], the hose is completely in line to improve heel clearance." Shimano equips its hydraulic disc brakes with Ice technology that features a clad rotor blade with a three-layer sandwich structure of stainless steel and aluminum. Shimano says that this provides a better radiation performance that reduces the temperature while braking. There are two Freeza SM-RT99 rotor size options: 140mm is the standard with 160mm as an option for people who want more brake power. Shimano also have a new high-end disc compatible wheel, the RX830, to go with the road disc brakes. Check out our previous report for details on that. 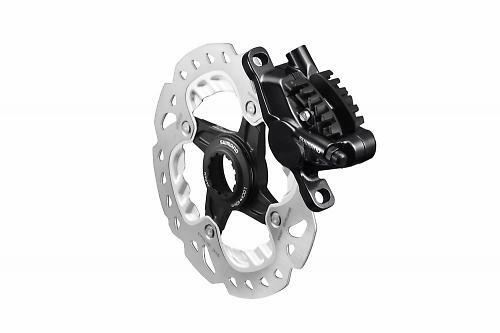 Shimano say that the ST-RS685 (the lever) and BR-RS785 (the caliper) will be available from August.